The article is in dutch, but in short: Harderwijk (the city) would like to build some houses at the shoreline of speedspot Strand Horst and closing the spot for a long period. Also it is unknown how much speedspot will disappear. The dutch Watersportverbond raised objections against this. Why would/could it be a change in a good way? There are a few things that could work out great. I am thinking about an event like the first FSM Bad Hoophuizen, going as fast as you can between 4 bouys. It is better and easier to follow by a big public (just need a good location, setup the speedstrip next to a beach). There will be more media possibilities. And an extra discipline next to free course GPS-speedsurfing is something that would make the competition more interesting. I remember the first NK speed (which I didn't participate). I was just thinking, does it make any common sense to participate next to USM??? What would be the extra value of the NK title I questioned. Now I simply pay and join the NK speed, but it still doesn't make much sense. It could be made into a big spectacular event with many surprises next to the USM (which also is spectacular). Ofcourse the question is: Is it worth the effort to setup something that will be new and exciting? I am aware it is easy to comment on such things like doing the NK speed different (which would cost much more effort), I respect the crew behing NK speed and also understand the way it is going now (they are all windsurfers too, and time on water is priceless). I wish to be able to help more, but truth is for now I just hope to get the best results. Truth is the next years the ability to make speedsurfing even more interesting/bigger does depends mostly on all volunteers, there is no big cashflow/sponsorship it is not F1. My small contribution is speedsurfingblog, I believe every little effort makes a difference. I think it would influence competition in a bad way. Consider you lose access to one of the most accessible and all-round spots; during the time of year when chances of speedsurfing-suitable winds are good. This simply means that training facilities become less. Plus IMO Bad Hoophuizen isn't that great in winter: the area that is suitable to speedsurfing AND that has sufficient waterdepth is very small. Chances of collisions etc. at Strand Horst are small, even on a good day when 50-100 speedsurfers turn up. When this happens, it is really bad news for our -already small niche- sport. Less accessible training are -> decrease of participants. IMO GPSSS format saved speedsurfing from death. The number of participants has gone up steeply in recent years; a change in the downward trend of 10 years pre-GPSSS. 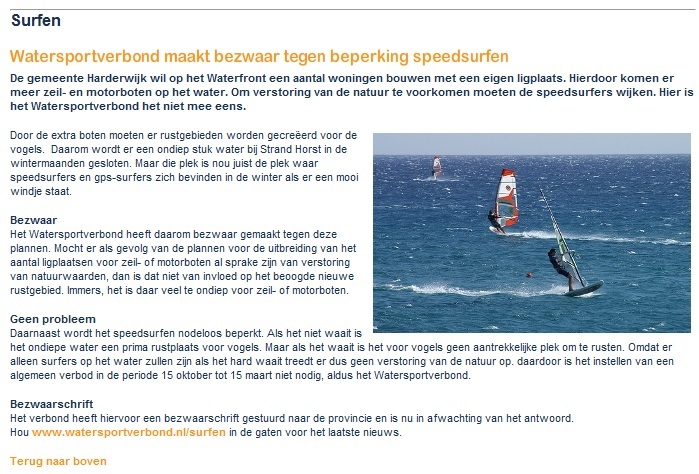 Now what will happen when access to the most popular speedsurfing location is blocked during the most windsure period? Never around 100 speedsurfers participated the NK speed. I did not mean 100 competitors at NK speed, I meant (but forgot to write) USM. But the principal point remains IMO: close down about the most popular an accessible spot; number of speedies will decrease; less "feeding" from grassroot to national level. Yes ofcourse, I fully 100% agree!!!! Strand Horst should never be closed down! I thought this was clear. O.K. Then it would be more logical to just promote the idea of an NK Speed somewhere else. No real point in linking this to closing of Horst, the large GPS-speed crowd over there and the USM's. USM's could still be qualifing events for an NK somewhere else couldn't they? Yes I would like to let Strand Horst be a part of the NK. hopefully Telstar is willing to make noise as well. The Amstelmeer had also some possible restriction for windsurfer (for the birds)... 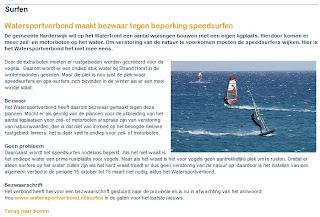 But thanks too the raise objections from windsurfclub (Lutje), surfshop Kater and windsurfschool leerwindsurfen.nl we can still windsurf around the small islands.